They inspire awe when you get close to the Himalayas yet the mountains are divinely benign when it comes to taking you in their fold. Anything related to the Himalayas is massive in scale be it the formation of the mountain ranges or the overlapping of the huge tectonic plates on the earth's surface. All these factors culminate in the formation of some of the tallest of Himalayan peaks which it seems pluck the snow from the sky and thus become the source of some of the most pious and perennial rivers of the plains below. The existence of Himalayas is therefore like magic which makes the place abode of the Gods. In the Indian sub conscious, most of the spiritual energies emanate from the Himalayas as some of the most sacred spiritual centres are located here and countless legends are associated with these mountain ranges. The devotees believe that the Sacred river Ganga which flows through the plains of India first falls on the head of Lord Shiva to soften its impact on earth and thereafter runs through the mountains after which it enters the plains giving life to the regions it flows through. The outside world however knows only of the tallest peaks of Himalaya. In today's age it is said that man has conquered a peak when he ascends on it. The pilgrims, however, interact with the mountains in a different manner as you can see in the case of devotees of Lord Shiva who circumambulate the Mount Kailasa to pay homage to the Lord. Those who are in search of the ultimateknowledge are naturally attracted towards the Himalayas. Pilgrimage is an all encompassing human religious behaviour which is practiced by all cultures. Therefore India is no exception when it comes to pilgrimages. There are holy sites galore in India all of which are either associated with the amazing feats accomplished by Gods or pious rivers or the presence of holy personalities. The Puranas (ancient Hindu texts) have several sections which tell us about the existence of sacred places where the devotees should visit to pay homage to Gods. With the rapid development in the modes of transportation today, the number of people undertaking these pilgrimages has grown exponentially. You can say that most of the religious beliefs and faiths in India originate from the Himalayas and Uttaranchal is one such region which is steeped in every thing religious. It is also known as Devbhoomi which means the Land of Gods. 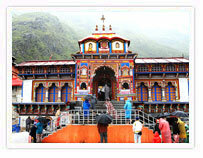 Some of the most sacred religious destinations such as Badrinath, Kedarnath, Gangotri and Yamunotri are situated here. This is a state that is full of valleys and high ranges where temples of different style of architecture are located. Some temples even look like Buddhist Gompas and Sikh Gurudwaras. Many of the temples are important places of pilgrimage which attract innumerous devotees from all across the country. 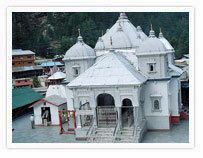 Some of the important shrines in Himachal Pradesh are Bajreshwari, Baijnath and the Chamunda Devi Temple. It is believed that Mount Kailash was formed about 30 million years ago and is one of the most sacred places in the Himalayas. Almost all the major passes of Uttaranchal take us to Kailash Mansarovar. It is located in western Tibet and for this reason, the number of pilgrims allowed to the place are limited.